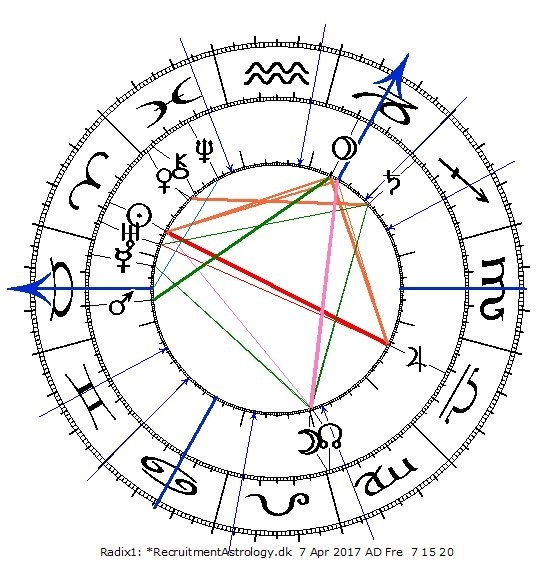 I received an email informing me that RecruitmentAstrology.dk had been launched at 7:20 April 7th 2017. The rectified chart for the launch is erected for 7:15:20. Chart ruler Eris is in Aries - even though Eris is not displayed on the graphical depiction of the chart. The Sun is in Aries. Mars, the ruler of Aries, is in conjunction with the ascendant.